PAWTUCKET, RI, U.S.A., February 12, 2015: A series of thermoplastic elastomer (TPE) compounds for window encapsulation and other injection molded automotive sealing applications provides a higher-flow alternative to thermoplastic vulcanizates (TPVs) while offering the potential for weight savings because of their low density. Sarlink® ME-2600 Series compounds are part of the broad Sarlink range of automotive TPEs to be featured at NPE2015 by Teknor Apex Company (Booth S24055). Based on styrene block copolymer (TPE-S) chemistry, the Sarlink ME-2600 Series TPEs exhibit 50% higher flow than the highest-flow TPV in the Sarlink range. Compared to other TPE-S materials, these compounds provide an enhanced surface appearance, improved tensile properties, better UV resistance, and greater stability upon heat aging. 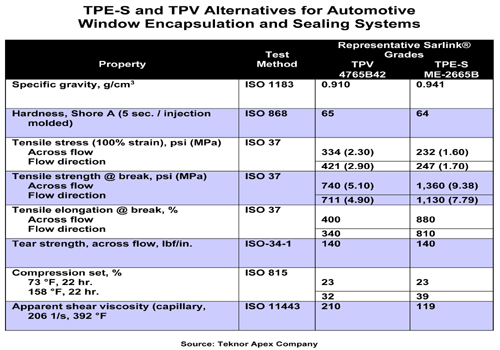 Because they are particularly low in density—0.94 g/cc, as against minimums of 1.1 for EPDM and 1.2 for PVC—Sarlink ME-2600 Series compounds also present an opportunity for weight savings.See attached table for properties of representative Sarlink TPE-S and TPV grades. 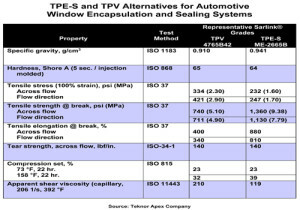 Teknor Apex recommends Sarlink ME-2600 Series TPEs for window encapsulation and other automotive seals requiring precise or intricate over-molding onto rigid substrates. The company can manufacture the compounds at its facilities in the U.S., Europe, and Singapore. For these ME-2600 Series compounds and all other Sarlink products, Teknor Apex is prepared to develop custom formulations, provide support in application development, and supply precisely the same compound grades no matter where in the world the customer operates its plants, noted Mr. Dickerhoof. The Sarlink® product range includes TPVs that exhibit superior compression set and durability, TPE-S compounds that offer excellent heat and UV stability, olefinic TPEs characterized by good low-temperature impact resistance and flexibility, and diverse alloys for adhesion to rigid engineering thermoplastic substrates. Among these materials are compounds that have received more than 70 OEM approvals for use in under-hood, interior, exterior, and sealing applications.